My son, Kieran was born last year in November. 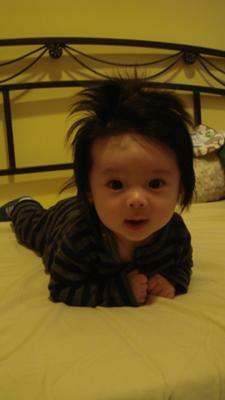 When he was born, he had a full head of hair. I have tried at every bath to brush his hair down to flatten it. When his hair is dry, it stands up all on his own. His hair just grows and styles it all on his own. Everyone on the streets that have seen him take 'double take' because of his all on his own hairstyle. Although many have also comment, "WOW..what a pretty girl." Again and again, my son is wearing blue and has pants on. He is just a very pretty boy.